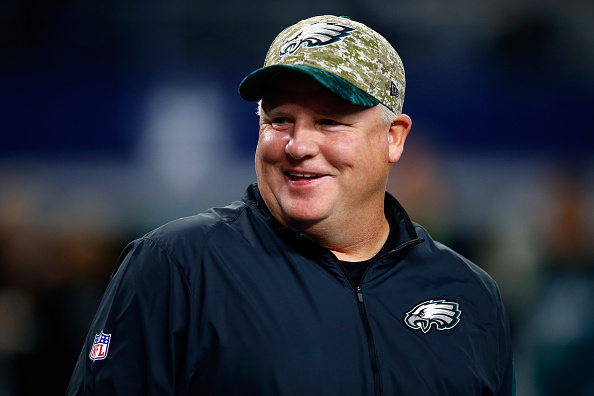 Could Florida entice Chip Kelly to return to college football? This season, Florida has lost two one-score swing games against LSU and Texas A&M. On Saturday, Georgia obliterated the Gators 42-7. That scoreline may have been flattering. Things have become real for Jim McElwain. The debate is no longer whether McElwain will be around next season, but whether he will finish this season. Reports have him negotiating a buyout and UF mooting the idea of firing him with cause over unsubstantiated death threat claims. Whatever McElwain’s exact status, things do not look encouraging. It’s time to look at where Florida goes next. Florida will be looking for someone to upgrade the offense. When the Gators were great under Steve Spurrier and Urban Meyer, they ran explosive, cutting-edge offenses. Florida fans have seen enough putrid pro-style for one lifetime. Expect the next hire to be a current head coach. The Gators went the coordinator route already with Ron Zook and Will Muschamp. Cost may be a factor. 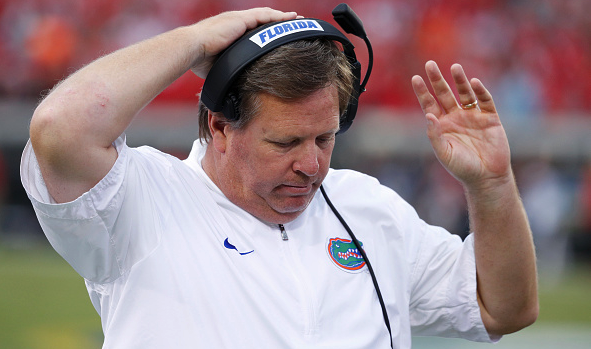 Florida spent a ton of money buying out Muschamp and bringing in McElwain. They will be paying more millions to buy out McElwain. Expecting the Gators to go into the $7 million per year range just for the salary may be pushing it. Which candidates will be considered? Kelly would be the big-name hire. He would bring the offense. With 46 wins and a 33-3 conference record at his last stop, few candidates would have a better résumé. With Kelly still having a ton of money due to him from the NFL, Florida could backload his contract and recover some of the money spent buying out McElwain. The question is whether Kelly wants to return to college coaching and at what level of media scrutiny. If Kelly wants to gun for a national title and not travel nearly as much as he did at Oregon for recruiting, Florida would be tempting. But Kelly can wait for the perfect fit or just not come back. He doesn’t need the money. Mullen is a proven winner in the SEC, to the extent one can be at Mississippi State. At Florida, he could have a loaded roster and a quality quarterback every season. Mullen knows offense and quarterback development. He did it at Florida under Meyer with some obscure dude named Tim Tebow. The continued poaching of his defensive coordinators is testament to how well he has done hiring them. Mullen and former athletic director Jeremy Foley had issues. But Florida’s new AD, Scott Stricklin, was Mullen’s former boss at Mississippi State. The knock on Mullen is he could be pricey. The Bulldogs pay him pretty well already. Florida would have to want him. Norvell is one of the nation’s hot young coaching prospects at 36. He had a great run as the offensive coordinator at Arizona State. He’s 7-1 in year two at Memphis. The Tigers’ offense has improved each year despite losing a starting quarterback (Paxton Lynch) before 2016 and an offensive coordinator (Chip Long) before 2017. Norvell would be making a big step up. But so would almost anyone taking the Florida job. One report labeled him the lead candidate. Campbell is only 37. But he is already in his sixth year as a head coach. He had nine-win seasons at Toledo before taking the Iowa State job. Campbell inherited a bleak situation. In year one, the Cyclones showed flashes. In year two, Campbell has Iowa State 6-2 and tied for the Big 12 lead with wins over TCU and Oklahoma. He has no experience coaching in the South and little at the P5 level. Recruiting is a big question in the SEC. But he can coach. Oregon has not been right since Scott Frost left. Things have gone very right in Orlando. He took UCF from zero wins in 2015 to six wins in 2015. This year, the Knights are 7-0. They crushed Mike Norvell’s Memphis, 40-13. Their closest game so far is a 10-point win at Navy. Frost will be somewhere in the Power 5 next season. Florida would have to fight off his alma-mater Nebraska to make this one happen. The best bet is he still ends up in Lincoln, but it’s worth a phone call. Emotion aside, Florida is a better job.